Just two days ago I found a 1948 edition of Mrs. Leyel's Hearts Ease, in which she elaborates on the works of Nicholas Culpeper, 17th century herbalist, apothecary and astrologer. 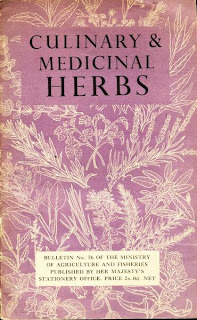 Culinary & Medicinal Herbs, Bulletin No. 76 of the Ministry of Agriculture and Fisheries, Published by Her Majesty's Stationery Office, 1951. 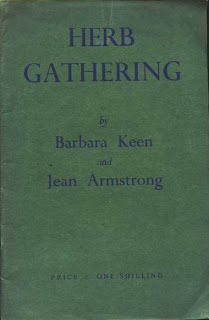 Herb Gathering, 1934, London, England. Explains herb by herb all the various ways they should be gathered to be used and preserved. The inside back cover carries an advertisement for Brome & Schimmer, Wholesale Druggists, Botanical Drug Importers and Spice Merchants, Drug and Spice Millers. These folks pre-date the Pharmacy Act. I wonder if they were put out of business by it? 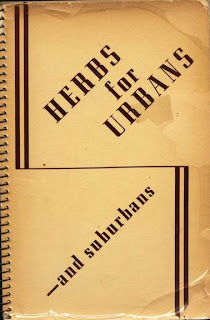 And then the rhyming Herbs For Urbans - and Suburbans, by Katherine van der Veer, 1938. It has a spiral binding, with a note on the back cover that the patent for said binding has been applied for. It contains lots of recipes, and a entire section on herbal vinegars, many with blended flavors, something I haven't seen before. 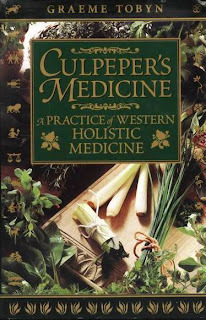 The entire book combines Culpeper's views on herbal medicine, philosophy and astrology, with an entire section on his life (1616-1654), and is focus on preserving health and prevention of disease. The author, Graeme Tobyn, is a practicing herbalist, and a translator of medieval astrological texts. Not often you see that combination. "The Liberty of our Common-Wealth (if I may call it so without a solecism) is most infringed by three sorts of men, Priests, Physicians, Lawyers...the one deceives men in matters belonging to their soul, the other in matters belonging to their bodies, and the third in matters belonging to their estates." Give me time to absorb the book and we'll share more Culpeper.